Season one of Supernatural, an American television series created by Eric Kripke, premiered on September 13, 2005, and concluded on May 4, 2006 after 22 episodes. It focuses on the protagonists Sam and Dean Winchester as they track down their father, John, who is on the trail of the demon who killed their mother and Sam's girlfriend. During their travels they use their father's journal to help them carry on the family business—saving people and hunting supernatural creatures. 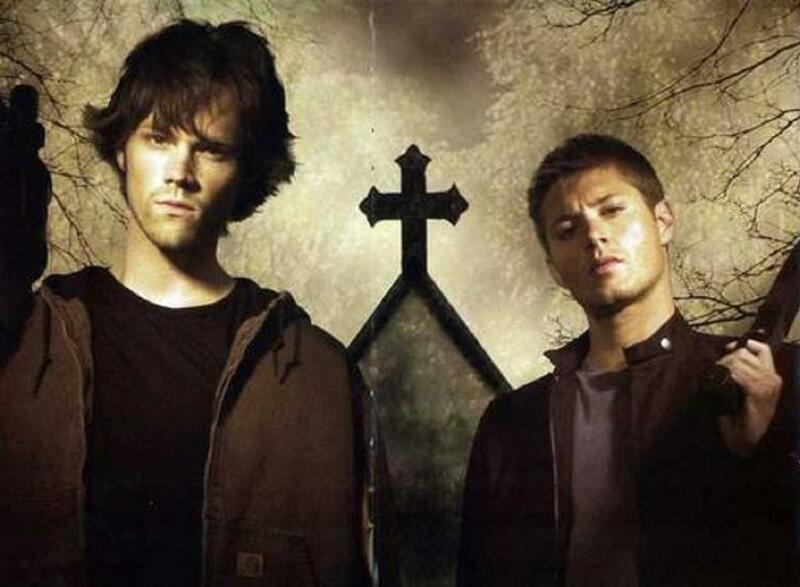 Jared Padalecki and Jensen Ackles star as Sam and Dean, with Jeffrey Dean Morgan recurring as their father John and Nicki Aycox as the demonic Meg Masters. When they were young, Sam and Dean Winchester's mother Mary died a violent and unexplainable death, which in turn led their father, John Winchester , to teach them skills which they might need in the search for whatever it was that took her life. Years later, while attending Stanford University, Sam is forced back into the paranormal world by his older brother, who has come to tell him that their father has mysteriously disappeared. The two travel to Jericho, California, to find him, but the discover that a ghostly Woman in White has been taking male victims. Dean is soon arrested , but he manages to escape custody, and saves his brother from the vengeful spirit. The Woman in White is finally put to rest . Sam later returns home, and discovers his girlfriend Jessica pinned to the ceiling. She is killed in the same supernatural manner as the boys' mother. Jessica's death prompts him to return to the life of hunting with Dean. After having no luck in the investigation of Jessica's death, the brothers follow instructions found in their father's journal and head to Blackwater Ridge, Lost Creek, Colorado. Posing as park rangers, they help a young woman named Haley and her younger brother Ben search for their lost older brother Tommy ), who disappeared while on a camping trip. Sam and Dean soon realize that he was taken by a wendigo that has terrorized the woods since 1936. While searching, Haley and Dean are kidnapped by the creature, but Sam and Ben are able to track them to a mine. After Dean, Haley, and Tommy are freed, they kill the wendigo with a flare gun. Taking a break from the search for their father, the boys head to Lake Manitoc in Wisconsin for a possible case. Three drownings have occurred there within a year, with the dead bodies mysteriously disappearing in the lake. The brothers soon come to believe that the spirit of a young boy haunts the lake, and learn that the local sheriff and the father of the latest victim accidentally caused his death when they were children. Out for revenge, the spirit targets the sheriff's daughter Andrea and mute grandson Lucas . It eventually pulls Lucas into the lake, so the sheriff gives himself over to the spirit, saving his grandson. The brothers are asked by a man whom Dean and his father had previously rescued to investigate the mysterious crash of a commercial airplane that left only seven survivors, with signs pointing to a demonically-possessed passenger causing the accident. When they realize that the demon is now eliminating the survivors one by one, Dean is forced to face his fear of flying by following its next target aboard an airliner. He and Sam manage to get the demon , but it flees its host during the exorcism. They continue the ritual, sending the demon back to Hell. When a man is killed—his eyeballs having exploded—after his daughter chants "Bloody Mary" three times in front of a mirror, Sam and Dean head to Toledo, Ohio, to investigate. They learn that Bloody Mary is the ghost of a young woman who was murdered after her eyes were cut out, and her spirit trapped within the mirror that she died in front of. With the mirror now for sale in an antique store in the town, Bloody Mary has begun to target those nearby who secretly feel guilt over another's death. The brothers must find a way to stop her after a young girl inadvertently becomes her next target. They track down the original mirror and then smash it, but this releases Bloody Mary. However, Dean forces her to see her own reflection, and her hatred for those with secrets causes her to vanish. After Zach , a college friend of Sam's, is arrested for murdering his girlfriend, the brothers head to St. Louis, Missouri, to investigate. Zach's sister Becky claims that he was with her at the time of the murder, although security footage places him at the scene of the crime. After a similar murder occurs, they realize that they are facing a shapeshifter. The shapeshifter captures the two, and plans to use Dean's form to kill Becky. The brothers escape and alert the police. Becky is saved, but the police believe Dean to be her attacker. As Dean later searches through the shapeshifter's lair, Sam visits Becky to inform her about what they are dealing with. However, she reveals herself to be the shapeshifter and knocks Sam unconscious before morphing back into Dean. Dean confronts the shapeshifter and shoots it dead—still in his form. Sam and Dean investigate the brutal death of a college student. The victim's girlfriend Lori says that the attacker was invisible. More attacks occur, with the victims seemingly connected to the girl. The brothers believe that the killer is the Hook Man, and research indicates their theory. To stop the spirit, they must destroy the hook, which unfortunately was reforged into an unknown object by the church after Karns' death. When they search the church for the object, Lori and the brothers are confronted by the Hook Man. Their quick thinking saves them, as the brothers realize that Lori's cross necklace is the object, and the spirit vanishes once it is burned. After a construction worker for a new housing development dies in a sinkhole, his brain dissolving within minutes, the brothers head to Oasis Plains, Oklahoma, to investigate. There they learn of mysterious, bug-related deaths in the town. They discover that a Native American tribe used to live in the area, but its members were murdered , with the tribe's chief placing a curse on the land as he died. Sam and Dean determine that the curse will reach its climax that night, and race to warn the family living there as swarms of insects attack. They are able to fight off the bugs and survive through the night, and the insects leave at sunrise. Sam has nightmares of a family being attacked by a supernatural entity in his and Dean's childhood home, prompting the brothers to return to Lawrence, Kansas. They enlist the help of their father's psychic friend, Missouri Mosley , to rid the house of a poltergeist. Though Missouri claims to have purified the house, Sam does not believe it was successful, so the brothers watch over the house. When the poltergeist returns, Sam's premonition starts to come true. The brothers rush in to rescue the family, but they themselves are saved by the spirit of their mother, who sacrifices herself to stop the poltergeist. Sam and Dean receive a tip from their father, and travel to Rockford, Illinois, to investigate the haunted Roosevelt Asylum, where criminally insane patients rioted in 1964. One of the riot's victims was the chief psychiatrist . The spirits there try to communicate rather than attack, leading the brothers to discover that the psychiatrist had been conducting cruel experiments on his patients . The ghost of the doctor then confronts Sam, causing him to lose his sanity and try to kill his brother. Dean manages to subdue Sam and burn the doctor's corpse, stops the spirit and returns Sam to normal. After tells them (trough a message) to investigate the disappearances of young couples in a rural Indiana town, Sam reveals to Dean that he would rather track down their father, prompting the two to angrily separate. As Sam meets a girl named Meg Masters , Dean starts the investigation and saves a traveling couple from a living scarecrow. Dean calls Sam about the creature, and discovers that a Vanir is being summoned in the form of a scarecrow . Because the couple intended for the ritual escaped, the townspeople choose Dean and Emily to be the new sacrifices. However, Sam returns and rescues them, and the scarecrow instead takes Emily's aunt and uncle as its victims. Emily and the brothers burn the sacred tree, and then leave town. Meanwhile, Meg hitches a ride on the highway, but slits the driver's throat, collecting his blood into a goblet and using it to communicate with an unknown being. While battling a Rawhead, Dean gets electrocuted and his heart is damaged. Doctors give him only a few weeks to live. Sam searches for a way to save him and believes he may have found an answer in a preacher who claims to heal the incurable. At the congregation, Dean is chosen, and is cured of his condition. However, he and Sam soon learn that an openly gay teacher died of a heart attack at the same moment that Dean was healed. The deaths occurred in unison with other healings, prompting them to believe that the preacher is using black magic to control a Reaper, healing people in exchange for the lives of those he deems immoral. They eventually discover that his wife is behind everything. As the brothers rush to destroy the altar used to control the Reaper, the preacher begins to "heal" a young woman with a brain tumor, and the Reaper goes after Dean. Sam destroys the altar, and the freed Reaper takes the wife's life, though the young woman is not healed. Dean is contacted by his first love, Cassie, who asks him to come to Cape Girardeau in Missouri to investigate a string of racially motivated murders, one of which was her father. Each murder is linked to a mysterious truck that seems to have no driver and leave no tracks. The brothers discover that Cassie's mother, a white woman, left her boyfriend Cyrus for Cassie's African-American father. Cyrus tried to kill him out of anger, but he gained the upper hand with the help of his friends and ended up beating Cyrus to death, dumping Cyrus' body and truck in a nearby swamp. Now Cyrus' spirit has returned and is out for revenge against everyone connected to his death. They eventually track Cyrus and put him to silence by burning his body . Sam has a premonition of a man being killed in Saginaw, Michigan, but the murder is made to look like a suicide. They talk to the victim's son Max and fail to find anything supernatural, but warn Max's uncle to be careful. When he, too, dies a mysterious death, Sam and Dean believe the family to be cursed. However, their investigation reveals that Max was regularly beaten by his father and uncle as a child. Sam then has another vision of Max using telekinetic abilities to kill his stepmother. The brothers stop Max, and Sam learns from him that, when he was a baby, his mother also died in the same manner as theirs. When Max's anger suddenly resurfaces, he locks Sam in the closet. Sam receives another premonition, showing Max kill Dean. Trying to escape, Sam manages to telekinetically free himself and talk Max out of killing them. A distraught Max then takes his own life. Sam and Dean head to Hibbing, Minnesota, where a young boy witnesses a man disappear. While investigating, Sam is also abducted. Dean pretends to be a police officer in search of his cousin, and teams up with Deputy Kathleen Hudak. She allows him to continue investigating with her, as her own brother went missing in the same manner three years before. Despite this, she does not trust him, and handcuffs him to her car when they find the kidnappers' property. Kathleen is soon captured, and learns that the culprits are a human family who hunt and kill people for sport. Dean frees himself and goes after her, but is also captured. However, this distracts the family long enough for Sam and Kathleen to break out from their cages, and the three of them subdue their captors. Kathleen shoots his father, lying to Sam and Dean that he had tried to escape. While investigating an animalistic death in Chicago, the brothers find a symbol of blood, which Dean later learns is connected to a Zoroastrian creature known as a daeva. They later run into Meg Masters, and Sam's suspicions of her lead him to discover that she was behind the murder. They confront her, but she reveals that it is all part of a trap set to capture their father. Sam and Dean manage to turn the daevas against her, and she is thrown out of a window several stories to the ground below. When they return to their motel room, they find their father waiting for them, but Meg returns and once again sends the daevas after them. Sam dispels the daevas with lighting flares long enough for them to escape. John then once again leaves his sons, feeling that they are vulnerable when all together.